TV reporter hypothesized: "I'd say 95% chance this is manufactured. Came out of a laboratory." Female reporter 1: "The source of the virus was traced back to drug testing done at Gen-Sys laboratories in San Francisco." Male reporter 1: "The lab technician - now known as Patient Zero - was accidentally exposed to retrovirus ALZ-113, an Alzheimer's trial drug that was being tested on chimpanzees." Male reporter 2: "The infected chimps showed signs of erratic and aggressive behavior that led to their escape from the facility." Female reporter 2: "The now-famous incident on the Golden Gate Bridge, a six-hour standoff with police, ended with the apes disappearing into Muir Woods." Male reporter 3: "Emergency rooms are being overwhelmed with patients showing signs of what's being dubbed 'the Simian Flu.'" Female reporter 3: "The CDC is projecting a fatality toll ranging from 5 million to as many as 150 million in the next 6 to 8 months." Male reporter 4: "Anyone showing signs of a contagious illness will receive special treatment here - the airport's purpose-built quarantine center." Male reporter 5: "Many of the new arrivals are children who have lost contact with their parents." Male reporter 6: "The mandatory quarantines have sparked civil unrest. Families are being ripped apart." Male CDC official: "Containment is not very likely." President Obama: "Prepare your families. Know your evacuation route." Male reporter 7: "The survival rate is now approximately 1 in 500." Female reporter 4: "Violence erupted in the City Center tonight. The third incident in as many days." Female reporter 5: "Martial law has been declared in 28 nations including the U.S. and Canada." Power plant spokesman: "The reactor is overheating. We can't stop a meltdown. At this point, our generator lost its power..."
Female reporter 6: "Just a total collapse of anything resembling civilian order." Female reporter 7: "Due to the extremity of the Simian Flu crisis, all regular government functions have been suspended indefinitely." Male reporter 8: "Those who aren't killed by the virus will probably die in the fighting. So, maybe this is it. This is how it ends. Pretty soon, there won't be anyone left." In summary, Patient Zero (Hunsiker (David Hewlett) from the previous film) - the first known carrier of the virus, ultimately spread the infection around the world. The virus was traced back to a San Francisco biotech lab, Gen-Sys. Because of the widespread pandemic disease, only 1 in 500 individuals survived. All normal functions ceased, martial law became rampant, and civil unrest broke out. Nuclear power failures caused a massive meltdown and millions of deaths. Civilization collapsed. 10 years later. The film officially opened with a pull-back from a close-up view of the face and eyes of Caesar, the lead chimpanzee (with vertical white stripes around his mouth), surrounded by dozens of other evolved, highly-intelligent apes (a new generation) who were living as a colony within Mt. Tamalpais State Park. Caesar signaled for his treacherous, scar-faced lieutenant bonobo ape Koba (Toby Kebbell) to lead a charge of spear-armed apes, to chase after and confront a herd of elk racing across the forest floor. During the hunt, as Caesar's adolescent son Blue Eyes (Nick Thurston) approached a downed elk, he was viciously attacked and wounded in the chest by a giant grizzly bear. Caesar called for reinforcements, and was helped by Koba to save his young son Blue Eyes, who speared the bear in the back. After his son was saved, Caesar told him: "Think before you act, son." The hunting party of apes rode on horse-back to return to their primitive settlement of dwellings established in the mountainous forest, in a clearing surrounded by a fortress of logs. As the proceeded through the forest, they came upon remnants of human civilization - a broken-down vehicle, and an abandoned 76 gas station overgrown with vegetation and vines. Caesar was summoned to his covered home shelter where his sickly chimp wife Cornelia (Judy Greer) had just given birth to another son (later named Cornelius). Shortly later, Maurice and Caesar reminisced about ten years earlier, when they were assaulted and experimented upon by humans: "Good, bad. Doesn't matter now. Humans destroyed each other...But we are family. Wonder if they're really all gone." Maurice assumed that humans had died out two years ago: "Ten winters now. Last two - no sign of them. They must be gone." The next day after an early-morning fishing expedition, two young apes Blue Eyes and his male friend Ash (Doc Shaw), walked along a forest trail and were stunned to come across a human hiker (later identified as Carver (Kirk Acevedo)) - who panicked, pulled out a pistol and anxiously fired on them, injuring and wounding Ash. The gunshot echoed over the valley and awoke Caesar and other apes. Five other surviving humans (with weapons) ran up on the trail behind the shooter, as Caesar and other angry apes (including Ash's father Rocket (Terry Notary)) appeared and surrounded the humans. The lead individual, hat-wearing Malcolm (Jason Clarke) urged Caesar: "We don't mean any harm!" as he whispered an aside to the others: "Do they look like just apes to you?" Caesar confronted the group and yelled out: "Go!" - the humans nervously responded by lowering their weapons and fleeing, leaving behind Malcolm's teenaged son Alexander's (Kodi Smit-McPhee) discarded satchel and a loose piece of paper with a drawing. Caesar delivered an order: "Koba, follow!" and a few of the apes led by Koba pursued after two trucks leaving the forest. Dreyfus: What about the virus, Ellie? Any chance of contagion? Ellie: We're all genetically immune or we would've been dead a long time ago. Malcolm was grateful that the apes spared their lives ("He could've killed us, but he didn't"). Carver was more paranoid: "Maybe he kept us alive, so they could follow us. They find out where we are, and they kill us all!" Malcolm described the lead ape: "He was remarkable." Dreyfus recommended that they keep their encounter a secret back at the colony, to avoid creating panic: "Not a word until we can figure out what to do." Their colony was set up inside a dilapidated former Federal Reserve Bank Building in the downtown area - its entry consisted of three wide archways armed by lookouts. Across the street was an unfinished, semi-built skyscraper tower. Inside the arches was a crowd-filled corridor with storefronts on the ground level, and many levels of apartment dwellings rising up on either side. Back at the ape's forest dwelling during an Ape Council meeting, Koba urged: "Must attack them now! Before they attack us!" Other apes, including Maurice and Rocket, were more cautious about waging a damaging war against the humans, and turned to support Caesar and his position: "If we go to war, we could lose all we've built. Home. Family. Future." After the meeting, Koba tried to persuade Caesar of his hatred and distrust of humans, and affirmed his own personal loyalty: "For years I was a prisoner in their lab. They cut me, tortured me. You freed me. I would do anything you ask. But we must show strength." Caesar agreed and planned to make his decision by morning. Apes do not want war but will fight if we must. Blue Eyes jumped down from his horse and returned the teen's satchel to Malcolm. Caesar then pointed to the forest (and then toward the colony) and ended his speech with an ultimatum and threat for the humans to stay in their own territory: "Ape home. Human home. Do not come back." The apes abruptly turned and departed. We're all immune, or we wouldn't still be here!...If they come back, they'll be sorry they ever did! Now, this city may not have the manpower it once did, but it has the firepower. Those stockpiles left behind by FEMA, the National Guard, we have it all. Look, I know why you're scared. I'm scared, too, believe me. But I recognize the trust you've all placed in me. We've been through hell together. But you all know what we're up against. We're almost out of fuel. Which means no more power, which means we could slip back to the way things were. That dam up there was the answer. Now we just had no idea they were up there, too....We find another way, because that power is not just about keeping the lights on. It's about giving us the tools to reconnect to the rest of the world. To find out who else is out there, so that we can start to rebuild and reclaim the world we lost. Malcolm: Give me three days. Let me talk to him. If it doesn't work, then we do it your way... He's more than just an ape. Dreyfus: You're not back in three days, we're going up there, and we're gonna kill every last one of them. While Dreyfus searched through Fort Point (an abandoned armory at the southern entrance to the Golden Gate Bridge) for weapons to arm the survivors against the apes, Malcolm chose additional members for a team to accompany him into the forest (in two trucks): Foster (Jon Eyez), Kemp (Enrique Murciano), and Carver. Ellie questioned Malcolm about the wisdom of taking Carver - the one who had shot and wounded Ash. Malcolm replied that he had no choice, because of his technical expertise: "He used to work at the Water Department. He's the only one who knows how the dam works." Malcolm was planning to tell Caesar "the truth" - and added: "And I think if I don't at least try this, there's gonna be a war." Both Ellie and Alexander urged and convinced him to let them join him. Malcolm drove the lead truck with three passengers (Carver, Ellie, and Alexander) to a blocked-off tunnel. Before proceeding ahead alone into the dense forest, he instructed everyone to remain in the trucks: "If I'm not back in two hours, you get everyone back to the city." Once deep inside the Ape territory, Malcolm came across animal skulls and bones arranged into 'scarecrows' by the apes. He was suddenly approached from behind by an immense gorilla guardian named Luca (Scott Alexander Lang), who roared and summoned other apes who surrounded Malcolm. He was captured and transported to Caesar for a face-to-face confrontation. Intimidated and pushed down into mud by other glaring and angry apes, Malcolm bravely offered his honest reason for trespassing and disobeying Caesar's ultimatum: "I need to show you something. It's not far....If I could just show you, then you'll understand." Koba threatened to spear the human to death from behind, but Caesar waved him off and responded: "Show me." Malcolm led the apes to the location of a massive dam and small power-plant ("hydro") that had originally directed electrical power to the north. Malcolm's intent was to direct the power lines back to the city. He explained that after the city's nuclear power plants stopped working years earlier, it had been using diesel generators and gasifiers. He wanted "to restore limited power" if the plant could be repaired. Malcolm made a formal request: "If you can let us do our work here..." - Koba interrupted: "You brought others?" Malcolm reiterated: "Just a few. I'm not a threat. If I am, then I guess you can kill me." Dozens of apes surrounded the two trucks in the forest, as Malcolm (led by Caesar and Koba) approached on foot. To his team, Malcolm explained the "one condition" agreed upon - they must turn over all their guns and work unarmed in order to work on the dam's generator. Later that day, Koba expressed his concern to Caesar: "If they get power, they'll be more dangerous! Why help them?!" Caesar replied: "They seem desperate... If we make them go, they'll attack." Koba was aggressively ready to strike: "Let them. We'll destroy them while they're weak." But Caesar wanted to maintain the peace: "And how many apes will die? We have one chance for peace. Let them do their human work. Then they'll go." Caesar's young son Blue Eyes took Koba's side, and did not believe in the humans' capacity for good: "Apes should hate humans." Caesar vainly attempted to explain: "From humans Koba learned hate, but nothing else." Malcolm's team camped in tents in the forest, as they commenced their work at the dam's power plant. During a heated discussion between Carver (distrustful and hateful toward the apes) and the others, he reminded Malcolm that his first wife Rita and a daughter had died of Simian flu, after which he married Ellie. She had lost her own family including her young daughter, Sarah, before marrying Malcolm and attempting to establish a new family with him and Alexander. As work commenced at the dam, the humans were surrounded by dozens of apes. Maurice informed Caesar that Koba was absent because he was "still angry" - and had gone hunting. In fact, Koba had taken his two cohorts Grey (Lee Ross) and Stone (Richard King) to the city. Atop the Golden Gate Bridge, they looked down on the human outpost of Fort Point, and during their spying mission watched as humans tested the functional arms discovered in the armory. Koba stealthily entered one of the buildings and viewed a stocked warehouse of weapons and ammunition, when he was suddenly spotted and approached by two weapons testers, McVeigh (Kevin Rankin) and Terry (Lombardo Boyar) wielding rifles. Koba glared back, then stuck out his tongue, gibbered at them, and then danced around as if he was simple-minded until they let him go. Koba told his companions: "Enough guns here to kill every ape. Must warn Caesar. Who knows what humans are really doing up there?" During their work at the dam, a blockage of debris was cleared by detonating explosives, although Carver suffered an injured leg. While conducting their work, Caesar's new-born baby son Cornelius approached and bonded with Ellie and Alexander - his first contact with humans. As the curious young chimp explored the work site, it uncovered a sawed-off shot-gun in Carver's tool-kit box. Carver grabbed his concealed gun and threatened both of Caesar's sons - Caesar sprang into action, angrily retaliated and knocked Carver down, and then reminded Malcolm: "Said no guns." After taunting the humans with the distasteful weapon, he hurled it into the river, and approached Malcolm with an order: "Humans leave now!" After Caesar marched off, the team began to pack up. When Caesar returned to his encampment, he found his mate Cornelia deathly sick. Ellie and Malcolm arrived to beg for Caesar's forgiveness and eliminate Carver from the team: "I'm sorry. That was all my fault. But I will make him leave." Ellie noticed Cornelia's sickness and offered antibiotics to treat her, although Caesar was skeptical: "Do not trust you." Ellie implored: "Let us help you" and Caesar allowed them to stay for only one day more. Foster led a resistant Carver to one of the trucks to leave the campsite, as Caesar looked on. Humans attack your sons. You let them stay. Put apes in danger! Caesar love humans more than apes! More than your sons. For his insolence, ape leader Caesar brutally beat Koba, but kept him alive, citing their law: "APE NOT KILL APE." Koba asked for forgiveness, in a supplicant position: "Forgive me." Later, one of Koba's two cohorts asked him: "You didn't tell Caesar about the guns we found?" Koba was hatching a secret plan to take over control from Caesar, and told one of his cohorts: "Neither will you." Koba told Caesar's impressionable son Blue Eyes about his father's dangerous attachment to humans: "Your father doesn't trust me now. You need to protect him. His love for humans makes him blind... As long as they are here, I fear for Caesar's life." Shortly after, Koba (accompanied by his two cohorts) approached the two weapons testers McVeigh and Terry in the armory, caught them unawares, and gunned them down with one of their own assault rifles. Back at the dam, Malcolm was able to successfully repair the generator. The lights began to shine at the abandoned 76 self-service gas station and nearby convenience store. Inside the newly-powered store in the woods, Kemp found a CD of The Band, and played the song "The Weight" on a sound system, bringing smiles and rejoicing among the team. Caesar arrived on horseback and shared in the celebration by extending his hand to Malcolm and exclaiming: "Trust." A short distance away, a snarling Koba ambushed Carver sitting in one of the trucks, grabbed him, and beat him to death. Carver's cigarette lighter and baseball cap were taken. In the apes' camp, Caesar led the rest of the team to an overlook-platform to gaze in wonderment at the sparkling lights of the city in the far distance. At the outskirts of the camp, Koba instructed one of his cohorts to use Carver's lighter to ignite one of the shelters. Then with his rifle in hand, Koba approached Caesar from a lower branch, aimed, and shot Caesar in the shoulder as the two locked eyes. After the loud gunshot echoed throughout the camp, Caesar plunged off the cliffside into the underbrush of the forest, as the rest of the ape village went up in flames. Shortly later, Caesar's son Blue Eyes appeared in the midst of the colony with Koba's rifle and Carver's baseball cap, calling out "Human Gun" - leading the other apes to believe that Caesar had been murdered by Carver. Maurice muttered a swift warning of "RUN" to the humans, urging Malcolm and his family to escape immediately. Humans kill Caesar! Burn ape home! Go! Get them! Apes must attack human city! Fight back! Come, fight for Caesar! Females and young stay in woods. We go to the city! (To Blue Eyes) We will avenge your father's death! The quickly-assembled ape army led by Koba charged through the forest toward the city, stampeding over the hollowed-out tree logs where the terrified Malcolm, Ellie and Alexander were hiding. We are survivors! Now, they may have got their hands on some of our guns, but that does not make them men. They are animals! We will push them back! Drive them down! And they will not get through these doors. A fierce battle ensued between the charging, heavily-armed primates and humans, and there were huge numbers of casualties on both sides. The tide of battle changed when Koba and the apes hijacked a tank with a mounted gun turret, and they were able to break through the settlement's outer barriers. The human fighters were forced to pull back during the chaos as many were captured, and Dreyfus was forced to flee underground. The next morning, Malcolm, Ellie and Alexander hiked through the misty woods and found the motionless body of Caesar - barely alive. They moved Caesar into the back of their truck, as Ellie tended to his shoulder gun-shot wound. As they prepared to drive to San Francisco (now under the apes' control), Caesar told them that Koba had shot him, not Carver: "Ape did this." In San Francisco's City Hall building, the apes pursued humans fleeing for their lives, to capture them. In Blue Eye's presence, Koba ordered his male friend Ash to kill an unarmed, defenseless man ("Go ahead, Ash, make humans pay! "), but the young ape balked and refused, citing his loyalty to Caesar ("Caesar wouldn't want this"). Koba pulled the resistant Ash up the stairs and tossed him over a wall to his death. He turned to the other apes and declared: "Caesar gone! Apes follow Koba now!" Humans were herded through the streets by armed apes to be imprisoned in large containment units or cages, where Koba announced: "Humans. You ape prisoner now! You will know life in cage. More humans out there. Go! Find them!" Even some apes still loyal to Caesar (Maurice, Rocket, Luca, and others) were chained and detained inside a fortified bus near the human cages. Maurice advised Blue Eyes: "Protect yourself." Once Malcolm's truck approached the city, Ellie was dismayed at a distant sight: "Look, the colony's on fire." The seriously-injured Caesar guided them to drive to his former home, where he had been raised by Gen-Sys' Dr. Will Rodman (James Franco) ten years earlier. The abandoned house would be a good place to hide for the time being. Malcolm volunteered to venture into the dangerous city to retrieve a surgical-medical kit to operate on Caesar. Malcolm stressed that they had to save Caesar's life: "He's the only one that can stop this." Blue Eyes: I'm so sorry, for everything. Caesar: No, I am to blame. Blue Eyes: But Koba betrayed you. Caesar: I chose to trust him because he is ape. I always think ape better than human. I see now how much like them we are. Blue Eyes informed his father that many apes had begun to follow Koba, although some who were still loyal to Caesar had been imprisoned, and then added: "Fear makes others follow but when they see you alive, they will turn from Koba." Caesar vowed: "I must do something to stop him." Blue Eyes offered to aid his weakened father. At the site of the fortified bus, Blue Eyes drew the four-pointed star image (the shape of the Rodman's attic window), to alert those inside that they would soon be rescued. That evening, Blue Eyes managed to free the apes imprisoned in the bus, and the humans held in a nearby containment area were also freed. In the attic of the Rodman house, a nostalgic Caesar viewed the display of a video-cam recording, filmed when he was a young ape being tutored in sign language by Will Rodman. Malcolm entered the attic and asked Caesar about the man's identity - Caesar answered: "A good man. Like you." C-4. Five-pound blocks. We just started setting them. They're gonna take down the whole tower. Blast them all at once. We could use your help. Koba: Caesar has no place here. Apes follow Koba now. Caesar: Follow Koba to war. Koba: Apes win war! Apes together strong! Caesar weak. Caesar: Koba weaker...Trusted Koba like brother. Koba: Caesar brother to human! Koba fight for ape! Free ape! Caesar: Kill ape! Koba fight for Koba. Koba belong in cage. The two rival apes fought each other, as the other apes watched their epic struggle. Back at the underground base of the tower, Dreyfus defiantly told Malcolm that he was misguided, and that they had already made radio contact with a military base up north that was providing reinforcements. Dreyfus claimed: "I'm saving the human race." He held up the remote C-4 trigger, pressed the button, and self-destructively ignited the explosives. The massive blast killed Dreyfus and his other supporters, while Malcolm narrowly managed to escape by hiding for cover. Hundreds of feet above, the explosion also destroyed much of the tower, and killed and injured many apes. While Caesar, Blue Eyes and others helped to remove girders from injured apes, Koba seized a machine gun and began to open fire - wounding Maurice. Growling and angry, Caesar jumped toward Koba, and the two tumbled downward. Koba was left dangling on a metal girder-ledge just below Caesar. Koba begged for his life: "Ape not kill ape." Caesar reached for Koba's hand, but then after having second thoughts, declared with a glare: "You are not ape" - and let go of Koba's wrist. Koba plummeted hundreds of yards down to his presumed death, covered with rubble. Malcolm: You're not safe here. They made contact. Other people are coming. Soldiers. You have to leave now. Everyone. Caesar, if you don't go, it'll be all-out war. Caesar: War has already begun. Ape started war, and human. Human will not forgive. You must go before fighting begins. I am sorry, my friend. Realizing that they had both sadly failed in finding peace, the two friends embraced and parted. In the lobby of the train station, the remaining apes knelt reverently (with upturned hands) before Caesar as their restored leader, who was now ready to lead them into another war. The film was book-ended by another tracking-in close-up of Caesar's solemn and furrowed brow and eyes. Cut to black. After the credits, very low sounds of heavy breathing, grunting and unidentified sounds of concrete rubble being moved were heard (suggesting that Koba might still be alive after surviving the fall). The setting was 10 years in the aftermath following the events of the previous film, in the year 2026. After a devastating plague (the Simian Flu) unleashed about 12 years earlier, a group of survivors (father and ex-architect Malcolm (Jason Clarke), Malcolm's wife and CDC nurse Ellie (Keri Russell) and leader Dreyfus (Gary Oldman)) were living in a colony within the ruins of San Francisco. The humans were attempting to restore electrical power to the city by gaining access to a hydro-electric dam in the apes' territory. They came into conflict with a growing tribe of sentient apes with genetically-enhanced intelligence, led by Caesar (CGI- Andy Serkis again). 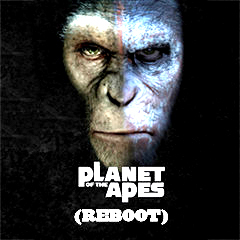 This film's plot was slightly similar to the one in Battle for the Planet of the Apes (1973), the fifth film in the original series. This film was the first "Planet of the Apes" entry to be filmed and released in 3D. With a production budget of $170 million, and box-office gross receipts of $208.5 million (domestic) and $710.6 million (worldwide). It was the highest-grossing (domestic) film of the 3-film "Reboot" Trilogy, AND it was the highest-grossing (domestic AND worldwide) film of the initial 9 films in the entire series. The film received only one Academy Award nomination: Best Achievement in Visual Effects. CGI technology was again used to animate the apes - however, the humans upon which the apes' movements were based, were talented acrobats, not just stuntmen. The next film in the series was War for the Planet of the Apes (2017), also directed by Matt Reeves.